Poems – The Friday Facade. | musings at random. Take a glance at today’s poem, if you wish. Here’s hoping that you can appreciate the message…we’ve all lived this one at some point. Happy reading, and best of days to all! I like this poem, and how true it is. When I worked outside the home, Friday was a glorious day! And then it was Monday again. Exactly….we all begin to yearn for and worship Friday so much (and speed through the other days as quickly as possible), that we forget everything else in between! It leads to a dread that can be hard to recognize. We have to find the beauty in every day, I’d say. It’s necessary work. You’re right. 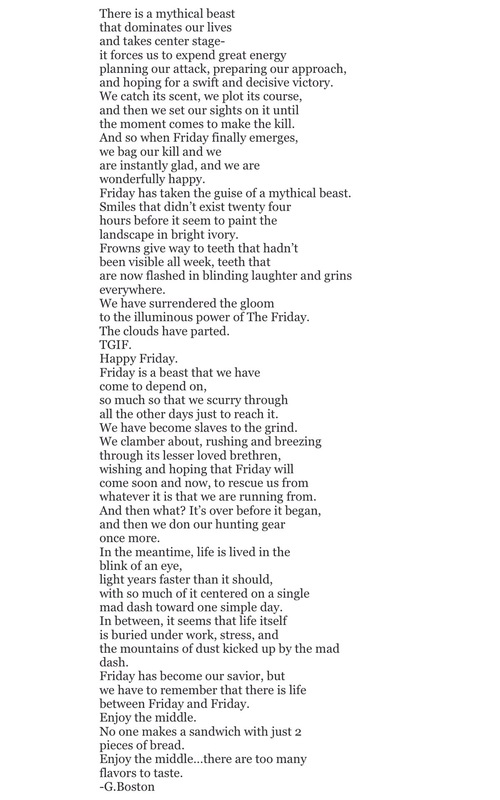 I almost forgot when I wrote my comment that not just waiting for Friday and then the weekend concludes with lightening speed, but while we’re so busy waiting for Friday, we’re missing the juice contained in Tuesday-Thursday, and rushing our lives away. Thanks for the reminder. You hit the nail on the head. We all obsess over a single day…or a string of days in the case of the weekends…and like that, it’s over, and we’re left back at the starting line. It’s a sad cycle…until we realize we’re spinning our wheels. We’ve all been there! We can’t allow ourselves to miss the juice, like you said. Life is entirely too short for that nonsense. Thank you so much for checking out and recognizing my page; I am immensely grateful for the support! Much respect to you. Love your poetry, pictures, musings. Fabulous! Thank you so much for taking the time to drop by and check things out. I appreciate that! Your blog is great as well…keep up the good work!